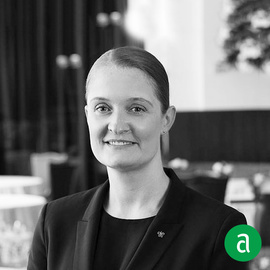 Sandra Schäuffele, Assistant General Manager at Per Se in New York City, shares her career timeline and words of advice for up-and-coming professionals. My first Job after Hotel Management School in Germany was in Austria as a Kitchen Server. I picked up a lot of my management style from my mentor there, the Maitre d’hotel, Mr. Ramsebener. He was very old school. He never told you what you had done wrong explicitly, but guided you to discover and correct it yourself. I’ll never forget him telling me one day, “guests don’t like to see leaves on the floor.” I knew there was something behind me that needed to be picked up. If you want to achieve something, push yourself to the limit. Reading, reading and reading. Learning should never stop. Challenge yourself by going to classes and getting out of your comfort zone. If you show respect to everyone around you, they will in turn respect you. The smiles from the guests and making them happy are the best motivation. I always remind myself, that there is a light at the end of the tunnel. Never let yesterday spoil today. While I was in school, a stage in your desired field (Hotel for me) was required. Despite being considered too young to work in one full time, the owner offered me a job because of my level of effort. Hard work pays off.